Beautiful!!! I think this is very well composed and lit!!! Thank you Mike, I am rather pleased at how this turned out. Interesting composition and use of light. I like beautiful contrasting colors on the rich black background. Thank you Emily, I actually played around a little with the lighting till I ended up with this, I rather like it! Good shot – is this natural light or did you use something for illumination? Hi Mike, I used a Canon Speedlite 430EX II (manual, 1/16th power shot through a snoot) low (as in just below the head of the tulip) camera left. Very nice. I love the softness of the depth of field and the crispness on the tip of the flower, it’s almost like a painting. The lighting is great too. Great shot David! I think it’s the vase that makes it. It changes it from a standard flower shot to something more interesting. Love the composition. 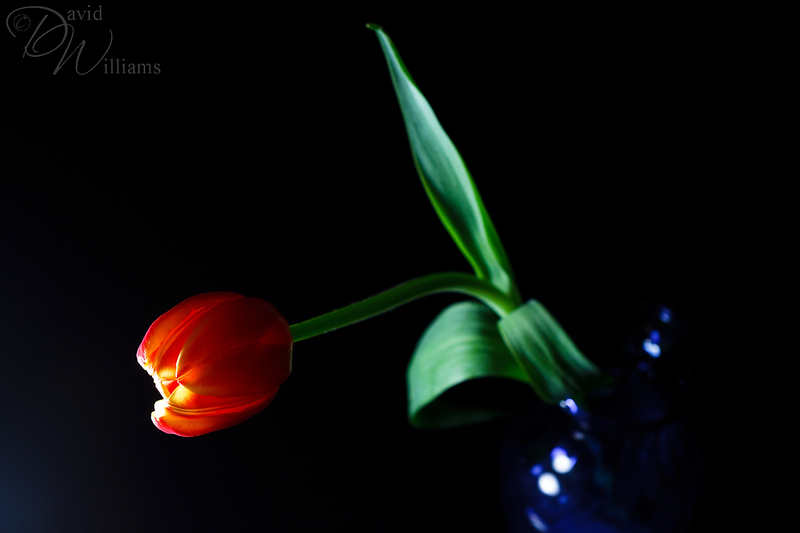 I like this lighting and how the tip of the Tulip is well lit and in focus. Unusual composition but quite nice.